Hands down the best warm chicken taco dip recipe out there, you guys! My Ninja Foodi or Instant Pot Chicken taco dip is creamy, filling and the perfect finger food for your game day event. Cheesy, tender tender chicken, beans, corn for the perfect hot dip for entertaining. It is no secret I love a good dip. Cold or hot you can count on me to test it out! Whether I reach for salty tortilla chips, baguettes or even carrots or celery, nothing beats a well done dip. My chicken taco dip is always requested when we are having appetizers. My friends and family go nuts for this recipe. I want to share how to make chicken taco dip in your Ninja Foodi, Instant Pot, and even your Slow Cooker! You might be saying your getting ahead of yourself girl! But let me say once you try this dip there is no turning back. You will want to make this at every chance you can get! Trust me, there is no wrong time to whip up this recipe. Maybe you aren’t planning to host the party at your house, that’s ok! This dip is portable and easy to dish into pan and take with you. Or make in a slow cooker and then keep it warm at the party. If need be you can make you chicken taco dip ahead of time. This dips is best served warm, so you will have to reheat the dip in your Ninja Foodi or oven. I personally have tossed in the oven and heated it at 350 degrees covered and cooked until it was warm all the way through. This chicken taco dip can last up to 3 days in the fridge. That is if it doesn’t get gobbled up on day one. When I reheat this dip you can dish it on a plate and heat in microwave or you can easily heat in oven like I shared above. I am not about the cleanup when it comes to cooking! I love to cook but washing pans and utensils is not my most favorite task! That is why I made these Football Deviled Eggs, crispy chicken wings, and chicken taco dip, without washing my Ninja Foodi pot in between. Yep you read that right! I cooked all three dishes back to back so I didn’t have to clean my pot and slow up my cooking as I was on a roll! It worked perfectly and then I had 3 easy appetizers to add to my menu for our game day appetizer feast! 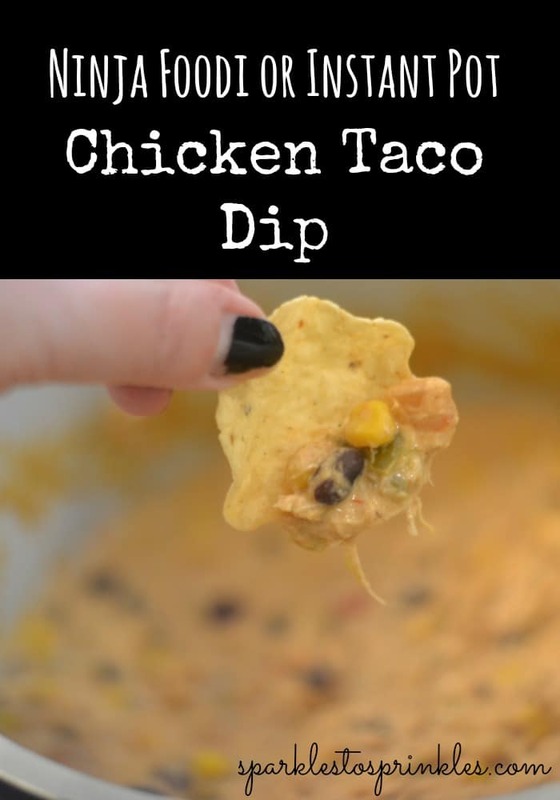 Give this chicken taco dip a try, and check out my other party appetizer recipes as well! You will be so glad you did as you root for your favorite team, enjoy good company, munch away! Remove chicken only and shred I used my kitchen aid to shred my chicken. Keep your IP/Foodi on low Add chicken back in. Stir and mix well. Directions for slow cooker: Place chicken, cream cheese, corn, black beans, green chiles, salsa, & taco seasoning in crock pot cook on low for 6 hours. Remove chicken and shred. Place back in the pot.